There are 5 steps to hiring an influencer through ViralSweep. 1) Explain your campaign. We will match you with influencers that match your criteria. 2) Influencers will submit a proposal to you. You accept or deny their proposal. Funds for accepted proposals will be held in escrow until the influencer's job is complete. 3) Influencers will create their content and submit it to you for review. 4) Once the content is approved, the influencer will post their content. 5) The influencer will provide links to their content. Once you verify there are no issues with the posted content, you will complete the project, releasing the funds from escrow to the influencer. Once your campaign is fully set up, hover over it in your dashboard and click Promote. Next, choose the interests of your influencers, their reach, and the social networks you want your campaign promoted on. You will also need to provide information regarding the promotion, as well as any talking points/scripts for the influencers to use. 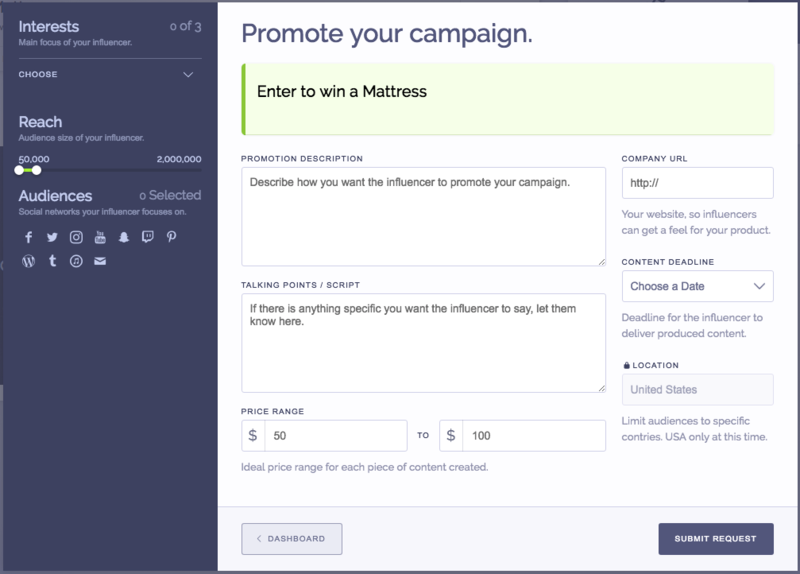 Finally, indicate what you're willing to pay for each piece of content created, and indicate the deadline for the influencer to create their content by. From here, ViralSweep will first review your campaign brief, and if all looks good, it will be approved and sent to influencers. Influencers will then begin writing their own proposals, and you will receive notifications every time you have a new proposal to review. To learn more, see ViralSweep Promote. Still have questions about Viralsweep Promote?Simply click the support or live chat icon to get in touch with us.